Invited to see and hear our bands perform at a concert, a competition, a football game, a basketball game, a parade or other local event. You’re invited to support the program through sponsorship, donations and volunteer opportunities. And, most importantly, you’re invited to join if you are a current or future Parkview student. Band participation and academic success go together. 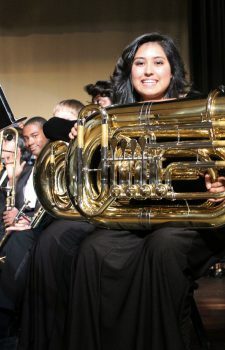 It’s no accident that the band is full of scholastic achievers; the discipline and work habits required for band carry over into schoolwork and testing. Band students are well-represented in Parkview’s Advanced Placement (AP) classes and each year our graduating band seniors win many academic honors and awards. Parkview’s band students are also active in school sponsored sports. Band students participate as team members and leaders on a wide variety of school teams—basketball, cross country, golf, lacrosse, tennis, track and field, soccer, swim and dive, ultimate Frisbee, and volleyball. Band is a welcoming community where everyone can find a place to belong. Students connect easily with fellow band members across all grade levels and learn to look out for one another. United by a common purpose, friendships develop and students learn valuable lessons about commitment, hard work and leadership. Parkview band students are frequently active in their community. Many volunteer throughout the year for a variety of projects benefiting causes such as food banks, underprivileged children and the homeless. Our band students hold leadership positions in numerous Parkview organizations, and have included multiple Eagle Scouts and Girl Scout Gold Award recipients.